What ever happened to the News? 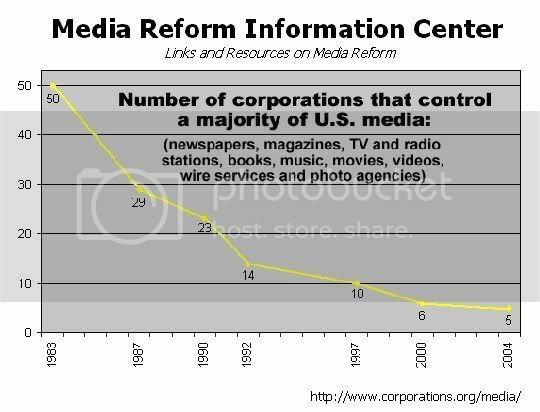 go site enter In 1983, 50 corporations controlled the vast majority of all news media in the U.S.
here in 2000, the number had fallen to six. Since then, there have been more mergers and the scope has http://cinziamazzamakeup.com/?x=acquistare-vardenafil-online-sicuro-Veneto expanded to include new media like the Internet market. More than 1 in 4 Internet users in the U.S. now log in with AOL Time-Warner, the world’s largest media corporation. http://maientertainmentlaw.com/?search=finasteride-long-term-how-to-get In 2004, Bagdikian’s revised and expanded book, The New Media Monopoly, shows that go only 5 huge corporations — Time Warner, Disney, Murdoch’s News Corporation, Bertelsmann of Germany, and Viacom (formerly CBS) — now control most of the media industry in the U.S. http://cinziamazzamakeup.com/?x=viagra-generico-100-mg-prezzo-piu-basso-a-Milano General Electric’s NBC is a close sixth.